Star Plunger Cutter Set. These cutters are ideal for use with a range of edible and non-edible materials including sugar paste; petal paste; marzipan or craft clays. 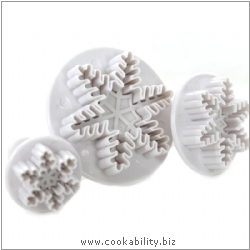 You can create a variety of snowflake shapes for sprinkling on cakes and cupcakes to create a fun design. Contains three different sized plunger cutters 55mm, 40mm and 25mm appx.